Welcome to the registration page for 2019 April Telepractice Workshop. If you already have an account you can login, otherwise, use the form below to create an account and register. Telepractice can transform your practice. 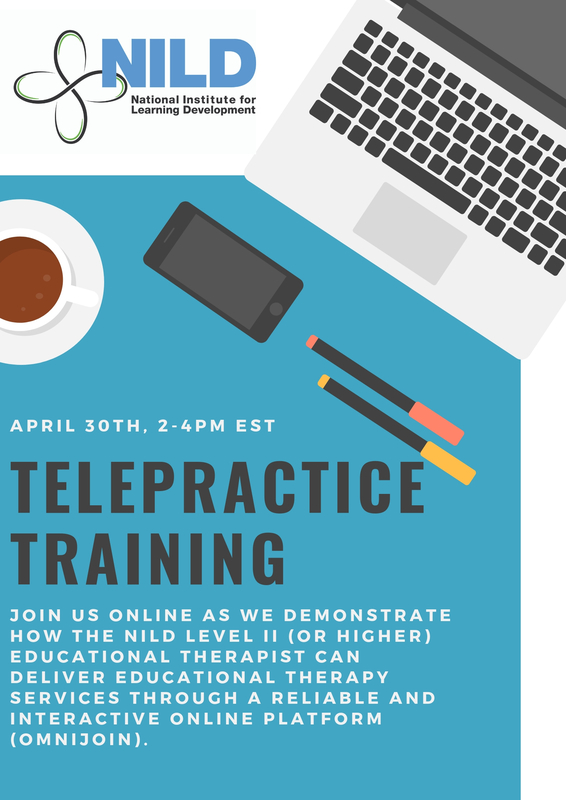 Maintaining the standards and procedures of each educational therapy session is crucial, so this training will focus on specific guidelines for how the integrity of NILD techniques can be maintained in a virtual setting. Therapists will see a demonstration of techniques to learn how to deliver sessions with the same accuracy as face-to-face. The entire training takes place online using the OmniJoin video-conferencing platform, allowing therapists to experience firsthand this user-friendly and interactive format. NILD has tested and refined this method for delivering educational therapy over the past two years and now we're excited to share this medium with you! If you already have an account, you should login first then you can join this event. You can register multiple people from the same organization, however you will not be able to create new contacts. Only existing contacts who are already connected to the organization can be registered. Which family member are you registering? This email is already in the system. Stellar Web Systems © 2019 is proudly serving NILD. If you experience any issues, please contact NILD via email or by telephone at (757) 423-8646. Client is defined as the company or organization operating Stellar through their service agreement. User is defined as any individual using the Stellar Web Systems online service. All materials provided by the Stellar tool including information, text, graphics, documents, logos, trademarks, sounds, images, multimedia content or otherwise which the client/user may see or read through the service are either provided by Stellar Web Systems or its respective third party licensors or agents and are property of copyrighted work of Stellar Web Systems and/or its respective third party providers. All Rights Reserved. Subject to the terms and conditions herein, Stellar Web Systems grants the Client/User a limited, revocable, non-sublicenseable, non-transferable, non-exclusive license to access and use the Service. You agree not to: (a) modify or alter any part of the web site or the service’s materials; (b) attempt to gain unauthorized access to the service, other members' accounts or account information, or other computer systems, servers or networks connected to this service; (c) The Client/User further agrees to comply with all applicable laws, rules and regulations governing your use of the Service. Stellar Web Systems’ provides the means for the Client/User to store data within the Service. Although Stellar Web Systems holds the data on behalf of the client/user, we will do our best to protect the data stored with regular backups and security checkups. Stellar Web Systems will always endeavor to provide competent security to protect the Client/User’s data. But we do not promise that the system is able to block all unlawful, malicious or illicit intrusions. Stellar Web Systems will not “mine” or “fish” through the Client/User’s constituents for emails, addresses or any other kind of contact or fiscal information for use other than in direct service as requested by the Client/User or explicitly permitted by the Client/User. WE WERE ADVISED TO MAKE THIS PART STAND OUT. THE SERVICE IS PROVIDED “AS IS” AND YOU USE IT AT YOUR OWN RISK. STELLAR WEB SYSTEMS EXPRESSLY DISCLAIMS ALL WARRANTIES, EXPRESS OR IMPLIED, INCLUDING WITHOUT LIMITATION THE IMPLIED WARRANTY OF MERCHANTABILITY, THE IMPLIED WARRANTY OF FITNESS FOR A PARTICULAR PURPOSE AND THE WARRANTY OF NON-INFRINGEMENT. WE WILL ALWAYS DO BEST OUR TO KEEP THE SERVICE FREE OF BUGS AND SAFE, BUT STELLAR WEB SYSTEMS DOES NOT WARRANT OR ENSURE CONTINUOUS, ERROR-FREE, SECURE OR VIRUS-FREE OPERATION OF THE SERVICE OR YOUR ACCOUNT. YOU UNDERSTAND AND AGREE THAT YOU SHALL NOT BE ENTITLED TO MAKE ANY CLAIM BASED ON STELLAR WEB SYSTEM’S FAILURE, IRRESPECTIVE OF FAULT, TO PROVIDE ANY OF THE FOREGOING. THAT’S THE LONG WAY OF SAYING “USE THE SERVICE AT YOUR OWN RISK”. IF SOMEONE’S LIFE DEPENDS ON IT OR THE FATE OF THE HUMAN RACE DEPENDS ON YOUR USE OF THE SERVICE, PLEASE DO NOT USE THE SERVICE. SOME JURISDICTIONS DO NOT ALLOW THE DISCLAIMER OF PARTICULAR WARRANTIES, AND, TO THAT EXTENT, THE FOREGOING DISCLAIMERS MAY NOT APPLY TO YOU. TO THE EXTENT THAT YOU LIVE IN A JURISDICTION THAT REFUSES TO ENFORCE THE FOREGOING DISCLAIMERS, STELLAR WEB SYSTEMS DISCLAIMS ALL WARRANTIES, EXPRESS AND IMPLIED, TO THE EXTENT PERMITTED UNDER THE LAW. IN NO EVENT WILL STELLAR WEB SYSTEMS BE LIABLE TO THE USER OR THIRD PARTIES FOR ANY DAMAGES, INCLUDING BUT NOT LIMITED TO DIRECT, INDIRECT, SPECIAL, INCIDENTAL, CONSEQUENTIAL OR PUNITIVE DAMAGES (INCLUDING BUT NOT LIMITED TO LOSS OF USE, BUSINESS INTERRUPTION, LOSS OF PROFITS OR LOSS, CORRUPTION AND/OR ALTERATION OF DATA) ARISING OUT OF OR IN ANY WAY RELATED TO YOUR DATA AND/OR YOUR USE OF THE SERVICE AND/OR YOUR ACCOUNT, WHETHER IN AN ACTION IN CONTRACT, TORT, EQUITY OR OTHERWISE. THE CLIENT VOLUNTARILY ENGAGES IN THE ACTIVITY OF INTERNET USE AND BEARS THE RISKS ASSOCIATED WITH THAT ACTIVITY. THE CLIENT WILL BE SOLELY RESPONSIBLE FOR ANY DAMAGE DONE TO YOUR COMPUTER OR YOUR DATA THAT RESULTS FROM SUCH ACTIVITY. IN NO EVENT WILL STELLAR WEB SYSTEMS HAVE ANY LIABILITY TO YOU OR ANY THIRD PARTY FOR UNAUTHORIZED ACCESS TO OR USE, ALTERATION, CORRUPTION, THEFT OR DESTRUCTION OF YOUR DATA AND/OR YOUR ACCOUNT. STELLAR WEB SYSTEMS’ LIABILITY IS EXPRESSLY LIMITED FOR ANY REASON AND UPON ANY CAUSE OF ACTION TO THE AMOUNT YOU ACTUALLY PAID TO STELLAR WEB SYSTEMS FOR THE SERVICE DURING THE THREE MONTHS IMMEDIATELY PRECEDING THE DATE ON WHICH YOU CLAIM THE CAUSE OF ACTION ACCRUED. SOME JURISDICTIONS’ LAWS PROHIBIT THE FOREGOING LIMITATION OF LIABILITY PROVISION. TO THE EXTENT THAT YOU LIVE IN A JURISDICTION THAT REFUSES TO ENFORCE THE FOREGOING PROVISION, STELLAR WEB SYSTEMS’ LIABILITY IS LIMITED TO THE GREATEST EXTENT ALLOWED BY THE LAW OF THAT JURISDICTION. The Client/User agrees to indemnify, defend and hold harmless Stellar Web Systems from all damages, liabilities, claims and expenses, including without limitation attorneys' fees and costs, arising from or related to Your data, Your use of the Service and/or any breach of these Terms by You. You further agree to defend, indemnify and hold harmless Stellar Web Systems from all damages, liabilities, claims and expenses, including without limitation attorneys' fees and costs, arising from or related to any claims by third parties that Your data or Your use of the Service infringes upon, violates or misappropriates any of their Intellectual Property Rights or discloses their Proprietary Information.